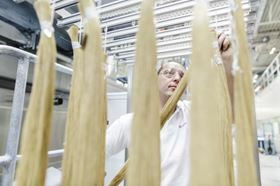 Evonik produces the polyimide hollow fibers at its site in Lenzing (Austria) which has extensive experience and expertise in the production of fibers. For manufacturers of nitrogen generators, which are often medium-sized engineering companies, the membrane process constitutes an inexpensivealternative for customized, needs-based nitrogen production. Evonik was able to combine two positive attributes: first, the SEPURAN® N2 technology requires fewer membrane modules than alternative membrane systems to generate the required amount of nitrogen. Second, the process uses less air, which means that the upstream compressor can be build smaller. This not only reduces the overall amount of energy consumed in nitrogen production but also lowers the investment cost, much of which goes to the compressor. Another advantage is that the SEPURAN® N2 membrane module can be connected to existing compressed-air systems, which enables on-site production of the inert gas at low investment cost. A white papers giving details of this new membrane and how it is reducing the cost of nitrogen extraction can be found by going to the 'Download' section on this website and filling in a brief registration form. A generator by ClorTec will be built to meet the water needs of two growing towns. Amazon Filters supplies SupaPore PPG pleated depth filter cartridges to pharmaceutical company. Microvi technology uses biocatalysts that intensify biological processes.